Matilda’s Flowers is a collection of ten gentle instrumentals assembled as a tribute to pianist/composer Rick Sparks’ grandmother. Included are seven original compositions, a wonderful cover of Sting’s “Fields of Gold” and arrangements of two favorite hymns. 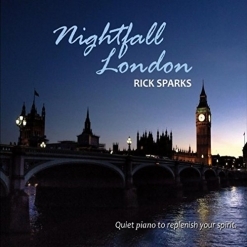 Most of the songs have digital orchestrations in addition to the piano, and the music is intended to take the listener to a place of peace and quiet renewal. 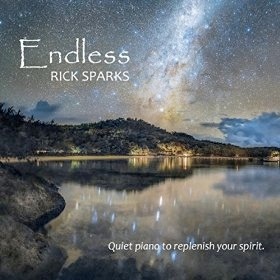 Rick Sparks began taking piano lessons at the age of seven, started playing the piano at church at 15, and went on to earn a Master’s Degree in piano. He has been a disc jockey and founded the new age internet radio station, The Cove. He is also a professor of mass communication at North Greenville University, Tigerville, SC. His 2014 debut, Endless, spent four moths on Zone Music Reporter’s US radio airplay chart, peaking at #7. Matilda is remembered as a strong but gentle woman “who loved flowers, her family and her Lord Jesus,” and these pieces express those qualities so well. The album begins with the title track, a warm and affectionate piano solo that reflects the sweet innocence of the cover artwork. The painting by Ludwig Knaus (1829-1910) is of a young girl picking an armload of flowers in a field - and the piece is a favorite! “Memories of Her” makes me think of Kevin Kern’s tender melodies - always a treat! The piano plays at a leisurely tempo with string washes adding pastel tonal colors. I love Sparks’ arrangement of “Fields of Gold”! It begins with the sound of heavy rainfall and thunder, giving way to flute, keyboard and strings - gorgeous and soul-satisfying! “Nothing But the Blood” is the first of the two hymns. Various keyboard sounds and voices keep the heartfelt melody simple and very effective. “Mountain Laurel” is another favorite. A piano solo for most of the first half of the piece, strings and wordless vocals are added to the second half. I love the graceful simplicity of the melody and the contented feeling of the piece. “Old Tennessee” is a nostalgic look back to a less complicated time - also a favorite. “Tildy’s Waltz” is a charming solo piano waltz that alternates between major and minor modes, giving the piece a bittersweet taste - my favorite piece on the album! “Nearer My God To Thee” is said to have been played by the ship’s orchestra as the Titanic sank in 1912, the year of Matilda’s wedding. Sparks has arranged it as a lovely piano solo that brings the album to a close. 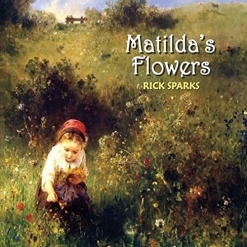 Matilda’s Flowers is an excellent second release from Rick Sparks! It is available from Amazon, iTunes, and CD Baby. Recommended!